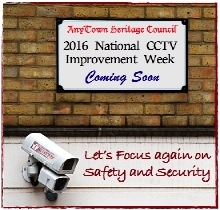 How efficient are your Video Surveillance Cameras? To celebrate the fourth anniversary of the launch of Doktor Jon's humble website project, October 2008 saw the introduction of a new and exciting "Helpdesk" support service, called 'VIPER'. Time and again, DJ comes across cameras which for a number of fairly obvious reasons, are not really 'fit for purpose'. It might be an incorrect location, the wrong lens being used, inappropriate set up or indeed any number of other factors, which all contribute towards reducing the efficiency of the camera, and in the worse cases actually compromising their usefulness as evidential tools in a criminal investigation. As part of the ongoing development of the TRUSTED© campaign, a new service is now being launched that provides an independent assessment of camera images, to determine whether there are any obvious deficiencies, and what can easily be done to improve the cameras effectiveness. The VIPER service works by allowing anyone to forward a JPEG image from a camera or recording, and Doktor Jon can then provide a brief written report and illustration on how well it's been set up, and what simple improvements could be considered to make it that much more effective. The report will also include subjective analysis in the form of a percentage score for various parameters. 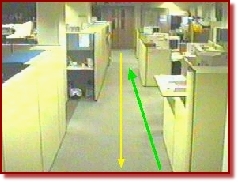 As a simple example, the image above left was originally captured by a covert standard definition CCTV camera using a wide angle 'pinhole' lens - as you can see, a significant portion of the picture shows useless 'dead' areas outside of the "optimum" red box zone. Compare this to the much more useful re-framed image above right (that's an immediate improvement even without moving the camera to a more effective location), which could easily have been achieved using a 'standard' pinhole lens with a narrower 'Field of View'. By marking up the correct camera coverage and showing the ideal alignment, the operator can now easily make simple changes to achieve an estimated 30 - 35% increase in target size, for minimal cost. 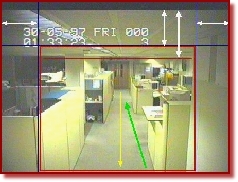 In this example using an old 1/2" CCD Colour Camera, something as simple as changing the existing lens from a 6.2mm (wide angle) to a 9mm (standard) and then readjusting the cameras position, would produce a significant improvement, both in terms of increased magnification, and also better optical performance. Had this been an overt camera, if there were an option to move the camera even further back away from the door, a 12mm or 16mm manual iris lens could be considered with typically an approximate 45 - 65% increase in target size on screen. If the camera had been fitted with a suitable Varifocal lens for example, the improvement could probably have been made in a matter of minutes, without having to buy a new lens. 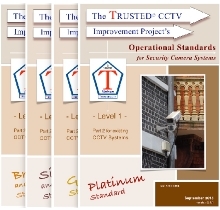 So do you have any video surveillance cameras that you think would benefit from a truly independent VIPER evaluation ...? As this service is available on request, (and in order to comply with UK law) Doktor Jon is only able to suggest a donation for producing a report on each image submitted, although if you would like to give it a try, you can always submit a single picture file for assessment free of charge normally within 48 hours. If possible, JPEG images should be restricted to no more than 200Kb in size, although larger files can be forwarded subject to prior approval. For anyone using remote control PTZ cameras, a similar report can provide details of the optimum setting for 'parking' individual cameras, to provide maximum evidential benefit when they're not being manually operated. VIPER reports will normally be provided by e-mail within 5 - 7 working days from receipt of the image, If you'd like any further details, or wish to comment on this service why not drop me a line.